This is everybody’s favorite pulutan, or finger food, which goes especially well with cold beer or wine. 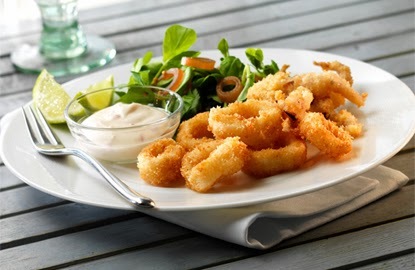 Calamares are one of the quickest and easiest Filipino seafood dishes to prepare. Filipinos usually cook this dish for parties. Frozen squid can be used, but fresh squid tastes better. 1. Clean the squid and cut them into rings (you may include the head). Pat dry with paper towels. Mix the salt and flour thoroughly in the mixing bowl. Dredge each ring in the egg then coat it with the flour mixture. 2. Heat a medium saucepan or wok over high heat and add the oil. Use a wooden chopstick or skewer to check if the oil is hot enough. When it’s hot enough, bubbles will form all around the stick. (or use a deep-fryer thermometer, which should be between 350° and 375°F when ready.) Reduce the heat to medium once it reaches the desired temperature so that the oil doesn’t burn. 3. Deep-fry the squid for about 7 minutes or until lightly browned. Do not overcrowd the pan. Drain on paper towels. If you fry the squid for too long, they become tough. 4. Transfer to a serving platter. Serve immediately with Sweet and Sour Sauce, Spicy Garlic Vinegar Dipping Sauce, Garlic Mayonnaise Dip or banana ketchup.